Have you ever had an idea for a blog topic for the Pearson Students blog but stop short of submitting it because you think you “aren’t creative enough” or “aren’t a good writer”? It’s time to put a stop to those negative thoughts and instead, focus on your approach. Whether you are writing content for a blog or an essay for school, creativity comes from how you think about the task. Everyone has their own unique approach, but I recommend mapping out all your thoughts and breaking down the process in order to captivate the right audience. Most students fret sitting in front of a blank screen, their hands on the keyboard, as if something is just going to ignite their fingers to type out something amazing. I found that most of my creativity comes when I write out all my thoughts using actual paper and pen. Before you even turn on that computer screen, get all your ideas onto a piece of paper because there is something about the glow of the computer that makes your mind flutter when trying to think a coherent thought. This might just be me, but I also find that I am much more creative when I write on blank white copy paper; it’s like the blue lines on notebook paper constrict my thoughts. Blogs or essays, no matter the length, follow a standard pattern: Introduction, main points, and conclusion. Most people start with the first sentence, but I usually keep those for the end. It sounds backwards, but you first need to know what’s going to go inside your sandwich before you start laying out the bread. Depending on your topic, organize four or five points that strongly support your main topic and that you can elaborate on in order of how strong they are. Once you have solid main points with good explanations, go down to your conclusion and summarize them. If your piece is a blog, you might ask the readers to reflect on the topic. If your piece is an essay, you would want to demonstrate your understanding of the material, maybe by adding some personal insight. Capture your reader’s interest, put the best content first in your introduction, but write it last. Once you have the rest of your piece done, you know about the entire topic and should be pretty knowledgeable and passionate about it. While it’s still fresh in your mind, ask, “What is the most exciting thing I learned through this piece? What is something I want my readers to think about?” You usually want to have a catchy opening sentence that either relates the topic to the reader or tells them something they may not know. Whether writing a short blog or a long essay, it’s easy to make your content captivating and creative. It’s all a matter of how you approach the situation. When it comes to writing, I recommend mapping out your thoughts on good old fashioned paper and organizing them before going to the computer screen. When you start typing out the content, start from the middle, then move on to the conclusion, saving the introduction for last. Pearson Students, what’s your next writing project? Will you approach it with a strategy? 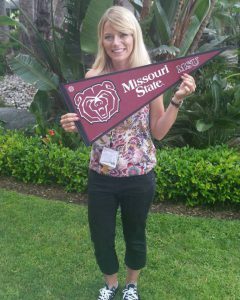 Jessica Albright completed her bachelor’s degree in Marketing at Missouri State University in May 2017, and jumped right into the Accelerated Masters of Business program at MSU, where she will graduate with her MBA with an emphasis in Data Analytics in December 2018. In her free time, she enjoys spending time with family and being outdoors. She is a huge animal lover, and founded her school’s first Animal Rights Club. Jessica has enjoyed being a Pearson Campus Ambassador for 3 years and the Student Editor-in-Chief for the Pearson Students Blog for the past 2 years. If you are a college student and interested in writing for the Pearson Students blog – click here to pitch your idea and get started!